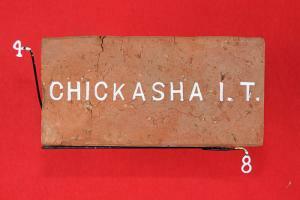 • Brand : CHICKASHA I.T. Among Oklahoma's varied and numerous natural resources, raw earth itself might not seem valuable, at first observation. However, deposits of clay and shale, the essential ingredient in brick and tile, are found in almost all of the seventy-seven counties, and most of the substance is suitable for creating some kind of building material. Clay products produced in Oklahoma have included face brick, common brick, paving brick, construction-grade terra cotta tile, drainage tile, plumbing tile, sanitary tile, pottery, and stoneware. Bricks have historically been one of the state's most important building materials. When true towns began to rise amid the hills and on the prairies in the mid- to late nineteenth century, residents customarily built their stores and homes of wood. Quite often, in both Indian and Oklahoma territories a town's first brick edifice was a bank. In hundreds of communities, "bricks" were erected after entire blocks of wood-frame buildings burned. Because it was fire-retardant, brick became the preferred construction material in the late nineteenth and early twentieth centuries. Oklahoma-made brick tended to be either red or dark buff in color, thereby giving character to the main streets of many towns. In addition to residences, churches, and business buildings of brick, a considerable number of barns and other farm structures and grain elevators were constructed of terra cotta tile blocks.